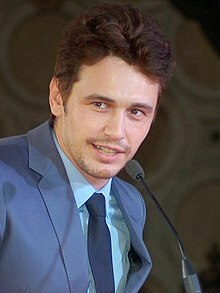 James Edward Franco is an American actor and filmmaker. His first prominent acting role was the lead character Daniel Desario on the short-lived cult hit television program Freaks and Geeks. He later played the title character in the TV biographical film James Dean , for which he won a Golden Globe Award. For his role in 127 Hours , Franco was nominated for an Academy Award for Best Actor. He is also known for his roles in Spider-Man, Pineapple Express , Rise of the Planet of the Apes , Spring Breakers , Oz the Great and Powerful , and King Cobra and other films, as well as TV roles in General Hospital and 11.22.63. In 2014, he made his Broadway debut in Of Mice and Men. James Edward Franco (born April 19, 1978) is an American actor and filmmaker. His first prominent acting role was the lead character Daniel Desario on the short-lived cult hit television program Freaks and Geeks. He later played the title character in the TV biographical film James Dean (2001), for which he won a Golden Globe Award. For his role in 127 Hours (2010), Franco was nominated for an Academy Award for Best Actor. He is also known for his roles in Spider-Man, Pineapple Express (2008), Rise of the Planet of the Apes (2011), Spring Breakers (2012), Oz the Great and Powerful (2013), and King Cobra (2016) and other films, as well as TV roles in General Hospital and 11.22.63. In 2014, he made his Broadway debut in Of Mice and Men. Franco volunteers for the Art of Elysium charity, and has also taught film classes at New York University, the University of Southern California, UCLA, and Palo Alto High School. The actor, writer and director stopped by TODAY to discuss his many projects, including the HBO series “The Deuce” and the animated film “Sausage Party.